Presented in an uncritical manner, the images of this four-part series appear pleasant and agreeable. These people are just the way they are, or that’s what they believe. At first sight, the setting, picture composition, style of painting, and colorfulness all add to the impression of harmony and insignificance of the scenes, which explore questions of gender relationships. „They cannot be meant to be just that“ or „today, one cannot paint pictures like that anymore“ –among others, these moments of irritation point the way to underlying layers. Another such moment is male dominance in the realm of everyday procedures, which may not be noticed at first. In a way, the uneasiness that slowly creeps in becomes the driving force for reflection. The images change irreversibly; their surface layer is cracked open to expose their critical core. The visual, sensual content of the painting is hardly touched in the process. These pieces are conceived form the materials of individually designed sales rep portfolios at an interior design agency. 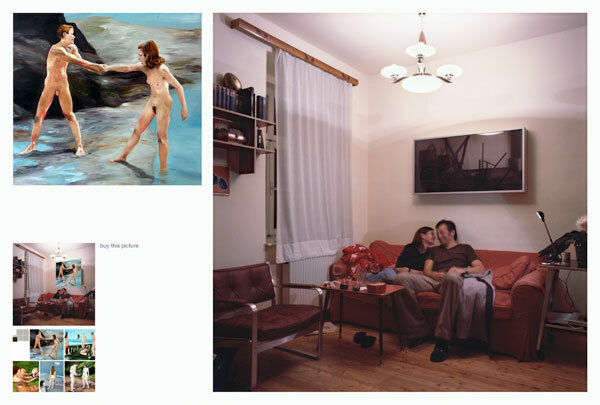 An image from the Stranding 1 series is recommended to the couples as an alternative to their pictures. the couples targeted as potential buyers of the pictures. The sales rep has taken similar photos of them: They sit on their sofa (sometimes with their children); bookshelves, slippers, unarranged objects lying around, visible artificial light sources, partly blurred persons due to long exposure time. These are continually recurring picture elements that lend the images the character of a series. Moreover, these people are in a good mood, tease each other, laugh cheerfully, are simply enjoying themselves. The sales rep – now inadvertently a portrait artist – knows what he’s doing. whether and how circumstances are illustrated / reflected / brought about by the (oil) paintings … whether and how the painter’s intention takes effect is in the sole responsibility of recipients and potential buyers.